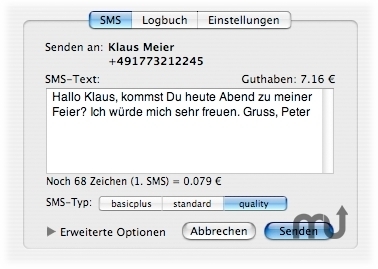 Address book plugin works with German SMS-provider sms77.de. Is there a better alternative to TheSMS? Is TheSMS really the best app in Plugins category? Will TheSMS work good on macOS 10.13.4? Address book plugin for Mac OS X 10.4. Works with the German SMS-provider sms77.de. However it maybe useful for people in foreign countries as well, who want to send SMS to Germany. TheSMS needs a review. Be the first to review this app and get the discussion started! TheSMS needs a rating. Be the first to rate this app and get the discussion started!